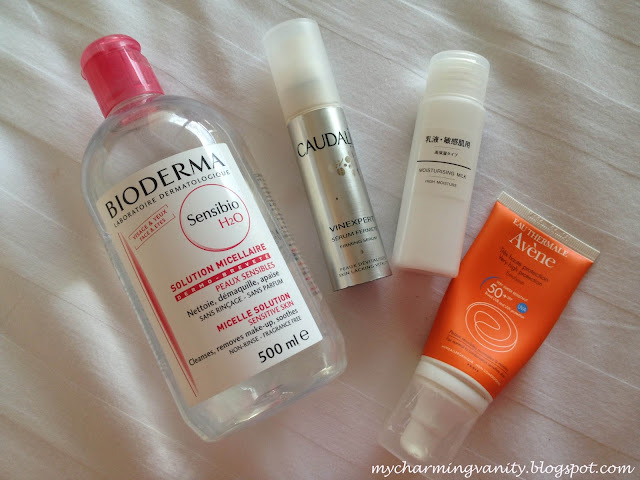 To start off, I'm in love with my Bioderma Sensibio H2O Micelle Solution (makeup remover). I got into using the product since I was posted in a new country for work and was unable to get hold of the Mandom Cleansing Express makeup remover. Prior to this, I did try out this much coveted Bioderma makeup remover before in Singapore (It's available in Guardian, and I found mine in Vivocity). However, I preferred Mandom simply because they are much more accessible. I would say that both products performed the same for me and the price point are pretty similar as well. The Caudalie Vinexpert Firming Serum is also at the top of my favorites list. I would say that this might be one of the my most enjoyed serum of all time. Though the price tag can be quite steep for a mere 30mL product, it has been working wonders on my skin. Sad thing however, is that the product can run out pretty fast. I have been using this for about 2 months and already, I feel that I might need to out purchasing another backup in case it runs out. Ever since I ran out of my Biotherm Aquasource Gel Cream, I've been relying on my Muji Moisturising Milk as day moisturiser. I originally bought this along on my worktrip with the intention of using it as a backup option in case I have to travel within the country for work. This was right up till my recent purchase of the SK-II Stem Power. I was sincerely amazed by how well the Muji moisturiser worked on my skin even though it comes with a drugstore price tag. I also liked the fact that the packaging is quite portable and is ideal for travel. I contemplated to purchase this as my permanent day moisturiser, but was unable to do so since I didn't drop by Muji while I flew back to Singapore. That said, I would totally recommend if you are in the market looking for an affordable and travel friendly moisturiser. The final product which I've enjoyed for a very long period is the Eau Thermale Avene emulsion sunscreen. This is kinda like the unsung hero within my daily beauty routine. I love how its non-sticky and it provides a really good sun protection for my skin, to the extent that when I went out island hoping, my face was the only area spared from sun burnt and crazy tan. In contrast, I had Banana Boat on my body and every single inch exposed to the sun was not spared. A separate post will be shared on my makeup and hair favorites. Stay tune and have an awesome weekend!